Don’t you just love having unique and personal things in your home? I know I do! Ever since I saw this Family Rules Canvas years ago in bloggy world, I have wanted to make one for our home. I loved the thought of having all our “rules” in one spot for all to see. Then I began seeing these “Family Rules” made into Subway art, which I adore. But I guess I’m lazy. I wanted to make one but it just always looked too hard for me! I don’t have a fancy-schmancy Silhouette machine to cut the words for me, nor a bazillion hours to spend on a project. And buying one? Out of the question. 1) WAAAY out of my budget and 2) they never say exactly what I want. Then I saw this “Family Rules” subway art on Meg’s blog. It is actually just a subway art poster print and she framed it. That’s when the light bulb went off….BINGO! I found a winner! Just a few days later I found this big ole’ picture at a yard sale for $1. It was nice and big and chunky. (Kinda’ like me 8 months preggo! HA!) I took out the painting and gave the frame a few coats of black spray paint. During our weekly Monday night date, my hubby and I came up with our own “Family Rules” Subway Art. We wrote down the things that we say ALL the time to our kids. It really made us laugh doing this! And of course wrote down things that we want them to remember by looking at every. single. day. After the brainstorming session, we broke out the laptop and made it...well, actually he made it, which was awesome since he has mad-photoshop skills…it would have taken me FOREVER! We had a blast working on this together! Yesterday we had it printed at Staples as a poster print, stuck it in the newly painted frame, and hung it where our summer list used to be. TADA! I absolutely LOVE it!! I can’t stop looking at it and reading it over and over. Seriously can’t believe it’s actually up on my wall! So finally, FINALLY, we actually have our very own custom Subway Art and I couldn’t be happier with it! Do you like Subway art? 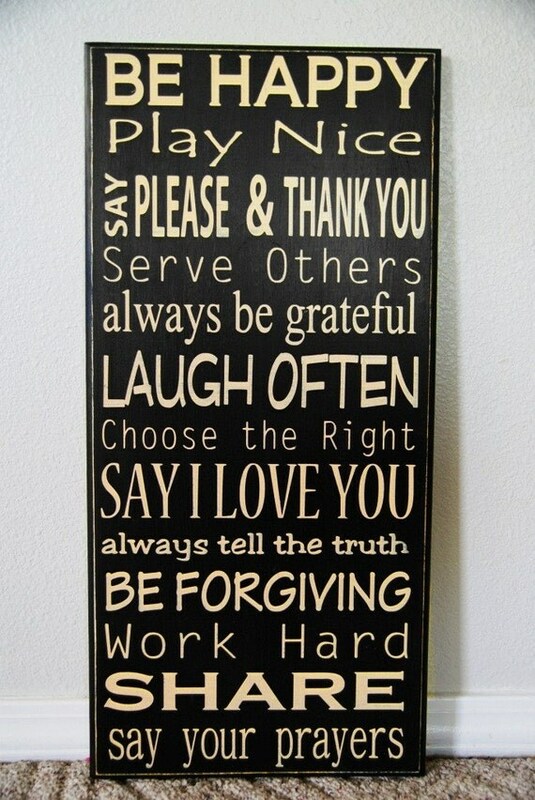 What would your “Family Rules” say? Laine that is awesome!!! :) I want one! You should sell this print... I would buy it :) I LOVE what it says and I say a lot of those same things day in and day out. Awesome job! I love this idea so much!! Thank you for sharing! I made one of these for our church women's brunch on Valentines day with a ton of the names of God. It was red on white and looked so cool but not as tidy as yours. I used butcher paper and red paint. I think they threw it away. I guess I shoulda kept it now that I know it's trending. :) I'm always so slow on these things, they aren't cool by the time I do em'. Ha!